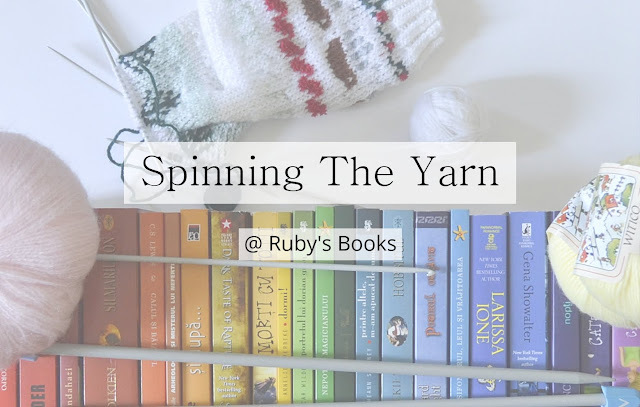 Spinning The Yarn is a weekly feature here at Ruby's Books in which I share some of my favorite knitting and crochet patterns inspired by books, with the occasional movie and TV show fandoms. Hello my dear geeky bookish people and welcome to another edition of Spinning The Yarn. As you probably know if you've been around for a while, about two or three years ago I discovered comic books and how wonderful they are. Since then, I haven't stopped reading as many comic books as I can possibly get my hands on. My increasing love of comic books is slowly morphing into me wanting to wear comic books. Sadly, there aren't as many freebie patterns out there that I truly liked. Most are charts (we'll get to them) or dolls. And that's just for Marvel and DC patterns. A lot of the wearables, like mittens and hats, are for kids. 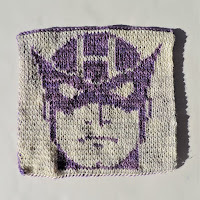 I'm not as good yet in my knitting and crocheting to know how to transform these patterns and make them adult-sized. Also, there aren't many patterns for all other comic books that are super famous, like The Smurfs, Asterix, or Teenage Mutant Ninja Turtles (the last one being my favorite animated tv show ever growing up). Out of everything I discovered, I fell in love with a few patterns and I decided to share with you. Let's get started! 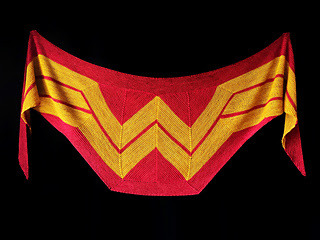 First we have this Wonder Woman shawl which I adore. Not only is it inspired by my favorite superhero ever, ever, but it's also really pretty. 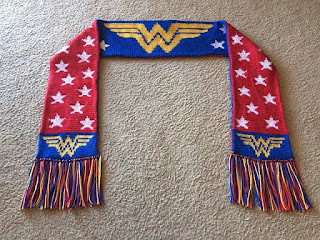 I actually might make it sooner rather than later, because every girl needs a Wonder Woman shawl in her life. There's also a crochet version, but I feel like the knitting version is the one I'm going to make. 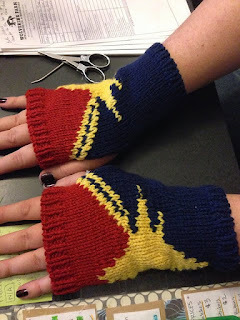 I stumbled across these Hail Hydra Mitts back when I was watching Agents of SHIELD and I decided I wanted to make them. First I'm a huge fan of fingerless gloves, second it looks so cute!! So I'm definitely going to make them. These Obelix are not a pattern, unfortunately. The creator only shared them as a project, but they're still cute and fabulous, and I had to share. BUT... now that I learned how to make socks, I'm fairly certain I can make my own version of these socks. Next up we have this Hawkeye chart. If you remember last week, I said that one of my favorite chart creators were the ladies behind Lattes and Llamas. They have a really wonderful project going on each year - a geek-a-long mystery blanket knit-a-long that I absolutely adore. Last year they made a Marvel vs DC blanket and they shared the charts they used. I couldn't share all the charts that I love, but since I have a small obsession with Hawkeye, I thought I'd share his. Last but not least, we have this TMNT chart by the same ladies behind Lattes and Llamas. Isn't this chart insanely cute??? I'd like to say there are more cute patterns that I want to make, and although there are tons more beautiful patterns out there, these are the ones I'm actually thinking about making.